Chromebooks are no longer fringe devices. Way back in 2015, Chromebooks outsold Macs. In the educational market, Chromebooks are dominating and growing quarter after quarter. During the first quarter of 2017 58% of computers sold were Chromebooks. Windows had 31% of the market and Macs 11%. Chances are someone you know is now using a Chromebook full time. I don’t know of any ergonomic keyboards made for Chromebooks. If you need ergonomic, you’ll need to buy one made for Windows or Mac. Technically, you can use any external keyboard with a Chromebook (even Google says you can). I have plugged a bunch of different models into my Chromebooks (I have three that I use) and they all work. Google is not totally correct with their advice. Some keyboards will NOT work well with Chromebooks. More on that later. Native Chromebook keyboards (built in keyboards) have special functions like a search button that opens the App launcher. They also have other special keys on the top row that can help you move back and forth in browsers, refresh a page, and show all open app windows. Using a Windows or Mac keyboard obviously won’t have these special Chromebook keys, though not having these keys is not going to destroy your productivity. You can use keyboard keystrokes to replace these keys. Trust me. You won’t miss any of these special keys. 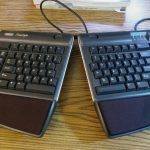 Here’s one problem I found with Mac keyboards and Chromebooks. When connecting a Kinesis Freestyle for Mac to my Chromebooks (all three), the keyboard works flawlessly. However when copying text (control + c), it works as expected. But once text is in the clipboard simply pressing control again pastes that text. So you can copy once and paste that same text again, you can’t copy something else until you restart your machine. You can’t ever use the control key again for anything else as they will just paste in the contents of the clipboard. This will stop your productivity cold. Fortunately I have the Windows version of that keyboard and it works with no issues. I tried getting support via Kinesis to see if this could be fixed and couldn’t figure out a way. As an engineer, I use all kinds of machines and simply plug in the best keyboard for whatever I am using. But you may not have as many keyboards! Bottom line. Any external ergonomic keyboard should work fine with a Chromebook. If you already have an ergonomic keyboard, chances are you should be ok. But if you need to buy one, get the Windows version if you can. Check out our guide for ergonomic keyboards for options.